Hello and Happy Monday YLF! I saw this Zara jacket on line and knew I had to have it. While I was in So. Cal for the YLF swap I stopped in a Zara and purchased it without hesitation. It is a lightweight sequin jacket that adds instant glamour to any outfit (I think). So easy. Picture 5 -- swap blouse from Mary K! It feels so good to work in. Can I get you something cold to drink? 1/2 -- Jeans True Religion Cameron (purchased with Mo in Tahoe); striped top Rachel Pally via Shopbop; jacket Zara (size M -- my usual jacket size at Zara is an S); sandals Adrienne Vittadini via TJ Maxx. Very round sunglasses from Anthro. 3 -- Jeans and jacket Zara, top Willow & Clay via Macys, wedges DV via Endless. I give up. I have TRIED to make crops work since last summer. I guess the lesson is, there are some looks that are not meant to be for me. I suspect it's my leg shape that's making crops so difficult -- my full thighs and skinny calves are magnified with this silhouette. But I do have a secret love for maxi skirts. 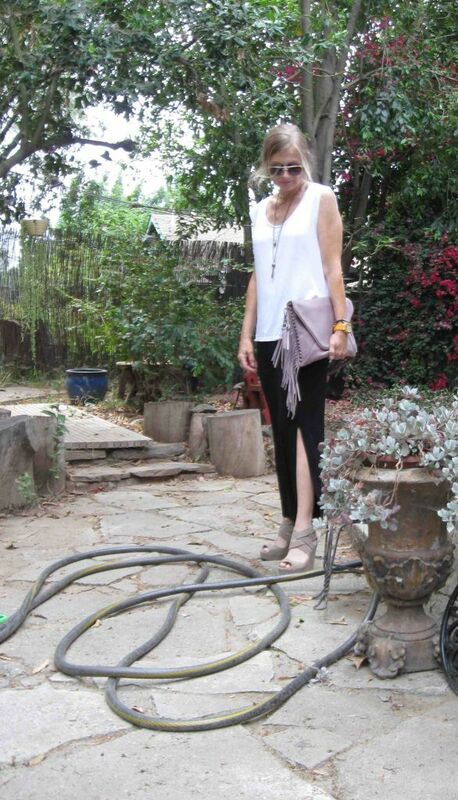 Here's what I wore yesterday, for a fun day in LA (doctor's, NAS, dinner out). I felt cool and comfortable, even driving in standstill traffic without a/c. Details: slit skirt from Bar III Macy's (last year), Viscose muscle tee from H&M, sandals DV, big fringe clutch from Tylie Malibu. Accessories. After an excursion into minimalist territory, it seems I am now (happily) back on team layered jewelry aka team maximal: long skull & fringe pendant from Yochi NY via Ideeli (last year); shark's tooth shorter pendant from A Peace Treaty (picture #2) via Shopbop. Neon orange watch from Invicta (trying to use up a year-old Rue La La credit). Thanks for looking, those who are maxi and maximal ambivalent included! I am calling this my "outtakes" WIW thread because I'm dumping a bunch of WIWs that have been sitting on my desktop for a month. Nothing spectacular and most of all the photo quality/scenery is not up to my standards. 1. -- Me in a dress! With leggings! Do you remember this dress which I was on the fence about? http://youlookfab.com/welookfa.....ees-thread It's the first one pictured in the thread. 2. -- Worn to the SF Opera. This was a try-on photo, that's why the hair is bad. In hindsight, a shorter jacket would have been better and summery heels. But -- I only wanted to take one jacket (picture 3) and I couldn't find the summery heels. 3. -- Worn to knock about SF. I went to the French designer Jean Paul Gaultier exhibit in this outfit. 4. -- A break from boyfriend jeans. And a could shoulder top. I got this top in Tahoe shopping with Mo. This picture was taken after a 13 hour work day (shopping for 50lb sacks of flour as well as 150 other items) and the outfit as well as I survived! Thanks for looking and opining!